The Handsome Boys are a fencing household created by Anastasia da Monte, Dionisio da Desio, and Lottieri Malocchio. They are a 16th century gang, named in English but run by Italians. 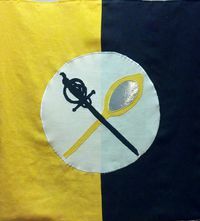 Blue Tyger Legion by Kenric III and Avelina III, August 12, AS 51. 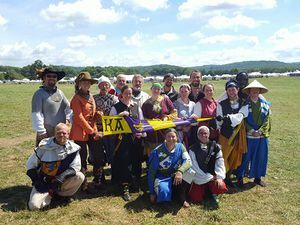 At every Pennsic war The Handsome Boys hold a tournament for the entertainment of a number of less-stabby gentlefolk. Each year our guests judge us on our comportment, style, skill, and wit and one Boy is chosen as the Handsomest for the next year. Sometimes the Handsome Boys hire mercenaries as cannon fodder to fill out their ranks during Pennsic Field Battles. This page was last edited on 10 April 2019, at 01:34.